The Secret City of The Absent Sane could be seen far across the water on the horizon beyond Hidden Ladder Island. Son of Antler Stealer lived there. He had a tiny rack of antlers and two giant human hands instead of feet. His father, Antler Stealer, had a huge rack of antlers that he had stolen from little deer in the woods on the outskirts of the city. Son of Antler Stealer lived in the shadow of his fathers antlers. He wished for a huge rack of antlers of his own. One day he grew restless and decided to swim out into the unknown. After a long journey he hit land. He climbed onto the shore and looked up to see a rainbow full of colors that he had never seen, colors that didnt even exist in the Secret City. All across the island Ladder People were smiling and laughing, standing tall in the glistening grass. Son of Antler Stealer looked up at the Ladder Person that was closest to him. He saw a window in its head. Inside the window was a night sky full of pulsing, burning, radiant starts. 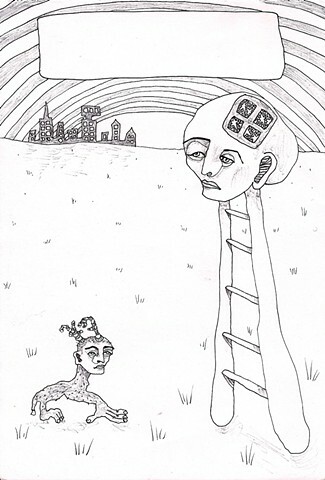 He felt an irresistible urge to climb up the ladder to the stars.